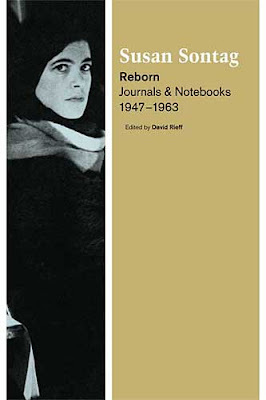 In Reborn: Journals and Notebooks, 1947–1963, the first of three volumes of Susan Sontag’s personal journals to be published by Farrar, Straus and Giroux, readers are offered an exhilarating glimpse into Sontag’s early experiences of school, marriage, lesbian relationships, motherhood, and life in Paris. Sontag’s writing, mainly brief, one sentence thoughts that encapsulate an entire experience or theoretical thought, often stream-of-consciousness or simply composed of lists of books to read or items to research further, still manages to retain a thought-provoking profundity and complexity that rushes us through the early years of her life. Perhaps the reading of others’ diaries is essentially a voyeuristic act, but in Reborn Sontag writes: “One of the main (social) functions of a journal or diary is precisely to be read furtively by other people…” For a woman who thought and wrote extensively about how photographic representation distances its subjects from its viewers and relegates experience to a form of surveillance without an ethics (although she would not write her significant theoretical essays until after the period of this volume) this statement is prescient: Sontag already understood that the reading of journals, private writings, and even personal letters serves the vital purpose of connecting us to each other, of offering us a chance to peer into the heart and mind of another person and identify with her on a profoundly sincere level. Certainly in Sontag’s case, the vulnerability and privacy that is exchanged for this social purpose bestows upon us a model of a powerfully analytic mind that is deeply useful.